Daniela Zehnder is a professional scenographer, stage- and lightdesigner. She creates and implements visual concepts for installations and performances with lights, space and movements. She works in direct collaboration with artists of other media and performers for interactive media. Music and Dance are mostly the live performed medias in her performances and installations. She has spent her life lighting up the lives of others - literally. About 25 years ago this professional sceneographer discovered that ³lighting makes everything come alive². Storming a male bastion, she began experimenting with the unconventional. First came the black and white stage with streetlights, circus lamps and boat lamps; ³really like a research of the base of light². She progressed to the slide projector and experimenting ³fully with colours². 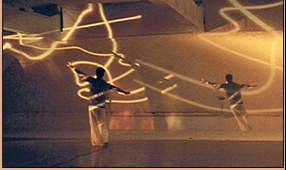 The hallmark of her work is combining light with abstract projections to design esoteric visions. And now it is the time of the LCD. For Daniela, it has been an exciting journey from the early days when, as a student of History of Art, she co-founded two inter-media associations: Raum-2 and Koprod. Then came exchange programmes with Poland, Turkey, and the USA. In collaboration with choreographers, musicians and artists of other media she developed, and continues to develop, performance pieces that she describes as ³dance-space-installations². The backgrounds are often unconventional: factory halls, historical ruins, billiard and disco-halls. Bangalore witnessed her proficiency at Zero Gravity with City Tags, an ongoing project spanning Baden, Berlin and Zürich, that was part of Attakkalari¹s Bangalore Biennial. Daniela has a special affinity for performing artistes, some of whom have described her as ³creative², ³sensitive² and ³with a fabulous spirit that transcends everything!² The abstract nature of dance and music gives her ³more freedom to createŠ with dance and light coming together like two partners². India has taken Daniela to heart. She, in turn, is fascinated with the constant colour and the quality of the bright sunlight that contrasts with her native Switzerland. But she observes that lighting in India ³is just a technical job not an art². Besides lights, Daniela Zehnder has devoted many years to the study of the moving body. Dance therapy in mental asylums was followed by massage therapy. She works with a variety of techniques that aim to promote physical mobility and psychological relaxation. She holds classes in creative movement for hearing-impaired children, and adults with severe learning handicaps. In the process, Daniela has learned a lot about ³human perception without the use of language². daniela zehnder arbeitet als lichtdesignerin und initiantin von intermedia- und interkulturprojekten in zürich und in bangalore (indien). das atelier lightsite hat sich auf eine besondere technik mit licht und projektionen spezialisiert in der benützung von digitalen bilder, abstrakten strukturen und farbigen projektionen. gemischt mit den lichtstimmungen und effekten von bühnenscheinwerfern entstehen visuelle räume. sie bilden stimmungsvolle hintergründe für tanzproduktionen, festivals und musikevents. bei tanzinstallationen verweben sich die bewegungen der tänzer und tänzerinnen mit den diversen lichteffekten. die festen bühnen- und kunsträume verlassend verlagert sich das neuste interesse auf die visuelle veränderung von stadt- und öffentlichen räumen. die zusammenarbeit mit internationalen künstlern anderer medien und kultureller hintergründe sind von wichtiger bedeutung für die künstlerische tätigkeit von daniela zehnder. nebst den produktionen in europa hält sich die künstlerin während drei monaten in indien auf. sie erteilt dort lichtworkshops für junge oder in ausbildung begriffene tänzer/- und digitale künstler/-innen.